Suitable from 12 weeks to approx 12 months postnatal, following any kind of birth. 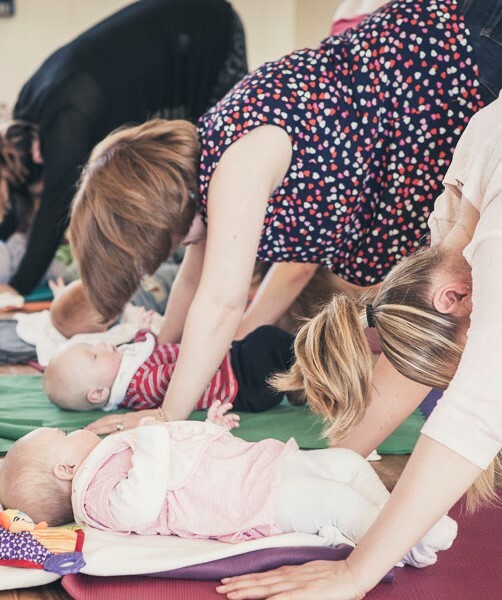 Mum and Baby classes are gentle, caring, fun, safe places for mums (or dads!) to enjoy an uninterrupted hour or so with their baby without the worries and concerns of day to day life. Classes are specifically designed for new mums to bring your body gently back to alignment, closing those overworked areas after pregnancy and birth, and supporting your journey in recovering strength and tone in a safe yet challenging way. Babies are integrated into class with simple Baby Yoga movements based on the principles and postures of yoga which will help you and your baby to communicate, bond and best of all relax. We focus on shoulders, upper back, lower back, and core, integrating Birthlight Yoga’s deep pelvic floor toning and ‘core strength’ micro-movements. Breathing and relaxation techniques will help you to re-balance, rejuvenate and re-energise for life with a new baby. Yoga poses and movements are given at varying levels to suit each individual. We work on gentle progression over the first 6 months postnatal to avoid long term problems of joint instability and hypermobility. This leads to a secure transition to stronger poses after 6 months and rejoining general yoga or other exercise classes. I am passionate about the benefits that Mum and Baby Yoga can bring to babies and parents. My classes bring some useful ways to support life with a baby, whether that’s different ways to hold and carry your baby, fun rhymes and movements where you can share a smile or laugh with your baby, or relaxation techniques you can use at any time for a bit of calmness in a busy day. All movements support your baby’s development stage. Classes are very sociable and you will walk out feeling more balanced, stronger and refreshed. No previous yoga experience is necessary. Although it is usually mums who come along, dads, grandparents and carers are welcome. These classes are a great follow on from Baby Massage. Please note that this class is not suitable for crawling babies.